I've been playing around quite a bit with this Tokina 12-24mm ultrawide zoom I picked up off Craigslist. 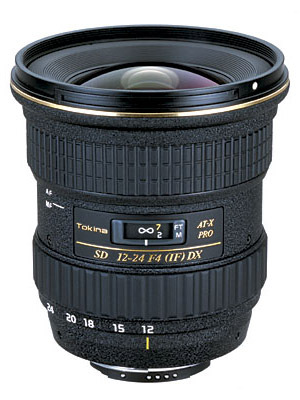 What a wonderful lens! It's built like the proverbial brick house and the image quality is outstanding for the price.. It's been a whole lot of fun playing with perspective. You can get some great shots by just getting in really tight with a subject in the foreground and letting the lens work its magic, exaggerating the distance and relative sizes between background and foreground. I'd love to take this thing to a sculpture museum! Another eye opening (did you see what I did there?) aspect of an ultra wide lens is that the depth of field is @#$ing gargantuan. When you focus a lens (or when the camera does it on your behalf), the point on which you focus exists on a plane, parallel to the image sensor or film, where objects will be as sharp as the lens is capable of producing. (It's a plane, by the way, not a sphere...) Anything closer or further away than this plane is at less than optimum focus. However, as long as it doesn't get too far from the plane of focus, it can be in "acceptable focus" which simply means that people won't perceive it as being blurry even though its not optimal. That area between the closest distance of acceptable focus and the furthest distance of acceptable focus is the depth of field. This new Tokina is sportin' some Bigass DoF! Example: If I set the Tokina to 12mm and f/8, and then focus on something about 3 feet (~ 1 meter) away, everything from about 1.5 feet (45.72 cm) to as far as the eye can see will be in acceptable focus. Why? Well, 3 feet represents a special distance for this lens. It is the closest distance at which the lens (when set to 12mm and f/8) can be focused while keeping objects at infinity acceptably sharp. This distance is called the hyperfocal distance and can be calculated mathematically (the Muddled Rambler probably mastered it in 2nd grade). And the calculation holds true in the real world too, assuming your idea of "acceptable focus" matches the math involved. By the way, if you want to know what the hyperfocal distance is for any lens, on any camera, at any aperture, check out the online calculator at DoFMaster.com. Better yet, download one of the myriad such calculators for your smart phone! Anyway, the Tokina's Bigass DoF also means that in a landscape situation, I can focus on pretty much anything between 3 feet and the horizon, and the distant elements of my landscape will always be in focus. So it's an extremely forgiving lens! There are some gotchas of course. First, as I alluded to, you may have a higher standard for "acceptable focus" than the math used to calculate the hyperfocal distance. This could very well be the case if the final output format is a really large print, for example. Second, at the hyperfocal distance, the distant background is at the very outer edge of the range of acceptable focus . Maybe a little too close to the edge, especially for that large print. In that case, you'd focus further into the scene than the hyperfocal distance. Alternatively, if the scene has something of interest in the foreground, you don't want that to be at the inner edge of the acceptable focus range either. It's best to focus on the foreground object to optimize its sharpness. If it's no closer than 3 foot, everything out to infinity should be in acceptable focus and it's better that your distant background live on the edge than your detailed foreground.